Book cover image from Bloomsbury Publishing site. Please do not copy. 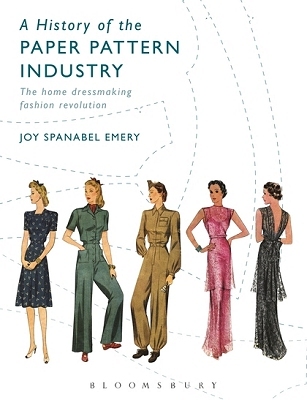 I’ve been looking forward to this book, A History of the Paper Pattern Industry, ever since I corresponded with its author, Joy Spanabel Emery, about the Commercial Pattern Archives Site at University of Rhode Island. Her book about the history of sewing patterns is now available from its publisher, Bloomsbury, or from Amazon or Abe Books. You can read reviews and summaries on their sites: Bloomsbury Publishing , AbeBooks.com , or at Amazon. I just found out that it is currently available in paperback for $35 or less, or in hardback. 272 pages; 125 colour illustrations and 75 black & white illustrations. Reviews mention that there are also scale reproductions of 9 patterns included for those who wish to enlarge them and make the garments. Joy Emery is Professor Emerita of Theatre and the Curator of The Commercial Pattern Archive at the University of Rhode Island, USA. She is also the author of Stage Costume Techniques. The Commercial Pattern Archive collection, of which Joy Spanabel Emery is curator, has over 56,000 commercial sewing patterns, and is available to the public for research (by appointment.) The enormous CoPA database can be searched online. For full access, you can subscribe for a modest fee (which is used to pay the students who work scanning and entering new patterns into the database). Or you can sample the database for free if you click on Sample. EDITED 10/31/18: CoPA membership is now free. The “Sample” page is gone, since you can use the entire site just by logging in. It is also now possible to search for a particular pattern number if you want to date it or see the layout, etc.